WEST PALM BEACH, Fla.  A fired Florida police officer was found guilty of manslaughter and attempted murder Thursday for fatally shooting a stranded black motorist, becoming the first officer in the state to be convicted of an on-duty shooting in 30 years. Raja's supervisor testified the officer had been told to don a police vest if he approached a civilian. Raja wasn't too popular around the station house if is supervisor testified against him. What police didn't know at first was that Jones had been talking to a tow-truck dispatcher on a recorded line. I bet that changed their version of events. I have no way of knowing what was in Rajas mind when he shot Corey Jones but it definitely wasnt justified. 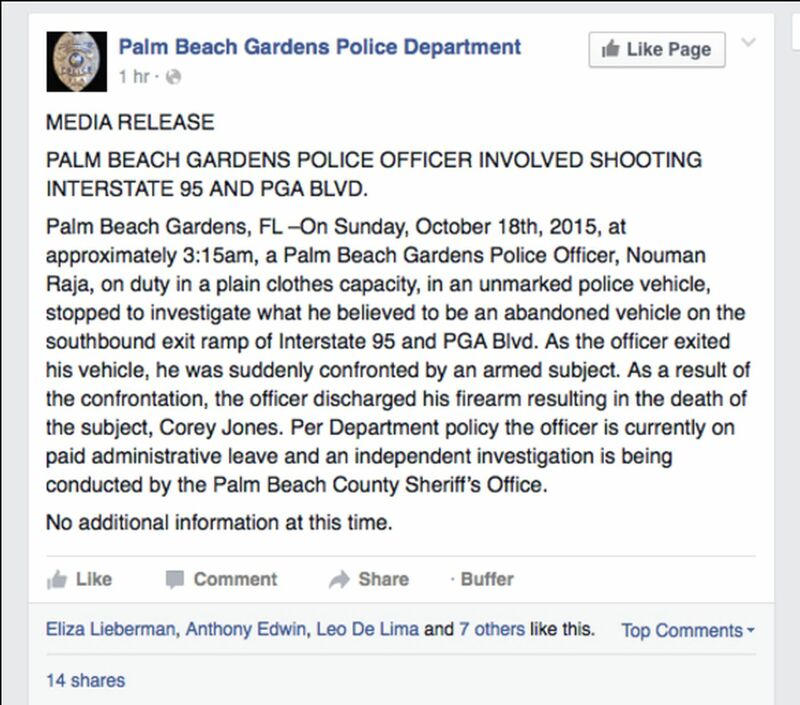 What is known is that Corey Jones was running away from Raja when he was shot. I think the verdict was justified. On you tube you can watch the sequence, with the audio recording, and see the still photos. The guy never identifies himself as a police officer, isnt driving a police car. Figures out the guy is armed inside his car, and tells him to put his hands up, but doesnt say he is a police officer. Then he fires multiple shots, the victim never fired. He might of initially meant well, did ask the stranded motorist if he needed help, but he ended up screaming at him and shooting him, because he was armed. The area the motorist was stranded in is a bit sketchy, cant blame the victim for being armed. He never left his vehicle, and never fired. In my opinion it was at least manslaughter. Cue the liberals to be mad at white folks for a Hispanic cop killing a black man. The cops LIED like crazy in this case until the tow truck company released their recording of the murder. I’m amazed that the police didn’t retaliate against the tow truck company...maybe that will come later. Lost in all this will be the fact that Raja had already been reprimanded for having confiscated drugs in his car (at his previous department) AND WAS TEACHING AT THE POLICE ACADEMY. That is not the way I read it. In the beginning, the police department was operating on what the cop said. The recording with the tow truck dispatcher gave them info they did not get from the cop. From that point on, the department seems to have acted properly. They put the cop on house arrest so he could not flee or cause more problems. Sounds like a muslim to me. it means “Hope” in Arabic. I think Muslim would be a fair guess. I wonder this this guy had a cross in his vehicle? Probably had more to do with the outcome than the 38. It this isn't news, I don't know what is. Why the move to chat? Karpinski said he learned of the tow-truck call five days after the shooting. Prosecutors said it shows that Raja’s actions made Jones think he was being robbed, causing Jones, who had a concealed weapons permit, to pull his gun. The point being that apparently the department did not know about the recording when they published the doc you show. That dock predated the discovery of the recording by 5 days. 1. Defend at all costs. 2. Consider adjusting when your story is proven untrue. The story is so poorly written that most would come to the same conclusion. I had to read through a lot of incomplete articles to find that. There are so many departments that cover for the bad cop that a department that does the right thing should get credit for doing it right. Sorry, thats a North Indian name, almost certainly a middle-caste Hindi speaker. I wondered why I didn't know about this case. Now I just watched it on the evening news. Don’t be an IDIOT. The article says he was a Christian preacher from a family of Christian ministers. or did you just forget to /s ...?